The male prostate is maintained in prime condition by a healthy abundance of Testosterone AND DHT. Testosterone supports cardiovascular health, muscle size, bone density and body tone. As a man gets older, healthy hormonal balance with abundant testosterone is vital for maintaining (and can even increase) healthy libido and erectile potency. You may not know this, but normal testosterone levels are ALSO essential for preventing mood disorders, such as anxiety and depression, that too frequently appear in men (and women) in their forties and fifties. Is it any wonder that after 30 years of age, a man's drive and performance begins to decline? His capacity for physical and sexual activity decreases. Not only that, but his body and emotional make-up become less masculine. When male hormone is lacking, feminization begins to take place. You will notice older men have less muscle, more fat and a softer appearance. Not only that, a man becomes less bold, more passive due to the shifting hormonal balance. The good news is, you can preserve your maleness for many years to come. Sexual potency, strong drive, emotional health and a masculine well-muscled physique can all be maintained when you know what to do. 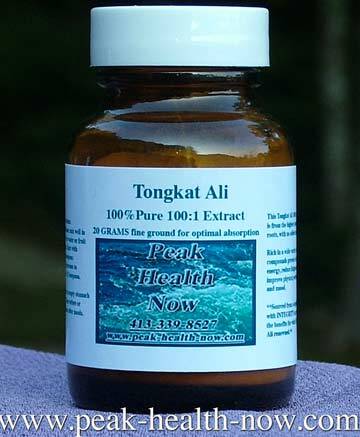 PHOTO BELOW: Our pure Tongkat Ali 100:1 Extract powder; NO excipients. Powerful, clean action - determined by our extensive personal trials. Sourced from a supplier with exceptional integrity. As a man gets older, healthy hormonal balance is vital for sexual potency. Testosterone supports healthy libido and sexual potency. Do you know that age and other factors can cause testosterone to be converted into estrogen? That causes all kinds of male health problems, including prostate problems. A very important key to maintaining a healthy male prostate gland is to keep that Testosterone from being converted to Estrogen. In addition, exercise that includes weights and cardiovascular workouts, and eating foods that support prostate health help to maintain your maleness. 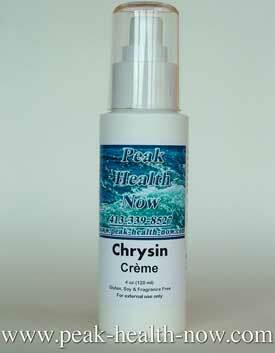 Chrysin Cream to the rescue!